The principal attraction of this hotel is the location for drivers. It is easy to get to by car and you can park in the street for free. It is possible to walk to the Alhambra in about 10 minutes. This hotel could be a good compromise for people who want to be in Granada but also go skiing every day because it is easy to get onto the road to the Sierra from here. 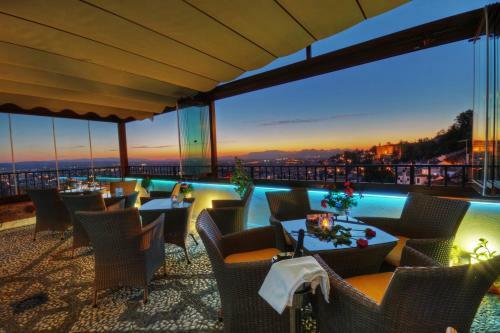 Another pleasant aspect of this hotel is the excellent views over the city of Granada. Every room at the Hotel Mirador Arabeluj has a private bathroom, a flat-screen TV and a desk with an electrical outlet. The hotel serves a continental or a buffet breakfast each morning. The red dot on this map shows the location of the hotel. The advantage of this accommodation is that it is in the centre of Granada but within easy access of the ringroad for excursions, skiing at the Sierra Nevada ski resort, visiting the Alhambra, etc. It is possible to park in the street outside the accommodation. This hotel is 450 metres from the Alhambra entrance, 1800 metres from Plaza Nueva (the absolute centre of Granada), 3000 metres from the train station and 4500 metres from the bus station.